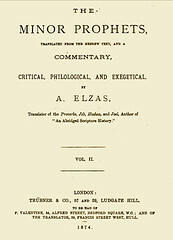 Abraham Elsaz, a Jewish theologian, was born 1835 in the small town of Eibergen, Province Gelderland, in the eastern part of The Netherlands, bordering Germany. He was educated in Holland, and went to England from Russia about 1867. He traveled extensively, visiting for scholastic purposes many parts of the world. 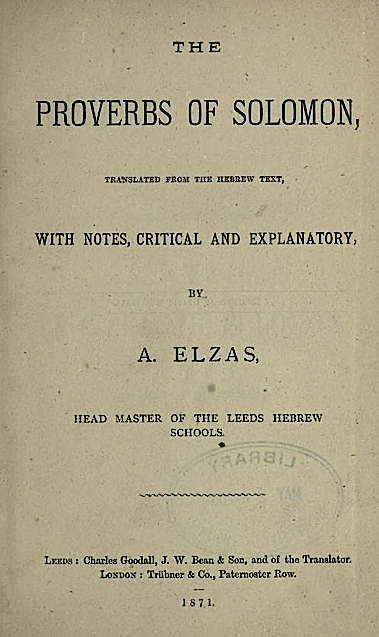 In 1871 he removed from Leeds to Hull, and there became master of the Hebrew school, and for some years filled the post of minister to the congregation. Owing to failing health he was obliged to resign his positions in 1877. For some years previous to his death he was occupied in literary as well as scholastic pursuits. He passed away in Kingston upon Hull, England (U.K.), in 1880. Publisher: Leeds, England (U.K.): Charles Goodall, J. W. Bean & Co.
London, England (U. K.): Trübner & Co. 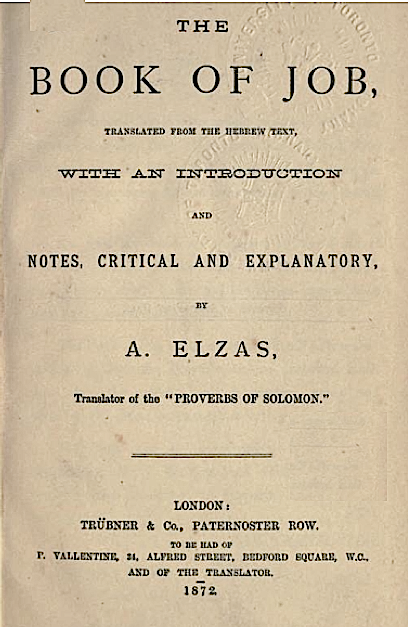 Contents: Proverbs of Solomon; – Preface. – Appendix: Various Readings of the Talmud. List of Subscribers. Comments: Clothboard octavo; sewn binding, 78 & (4) pp. ; Scripture text in single column, versification in the margin. 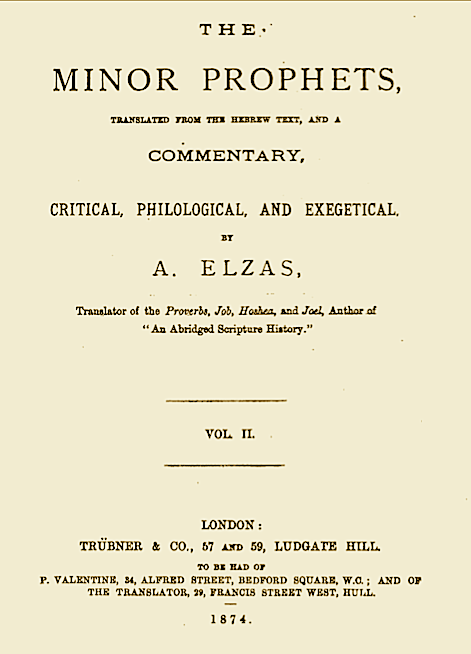 Explanatory annotations, together with alternate readings, cross references, in footnotes. 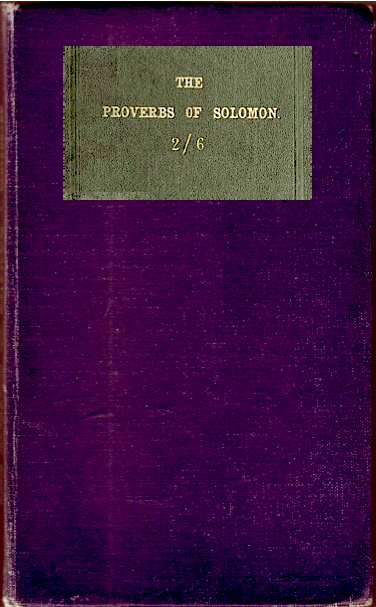 Publisher: London, England (U.K.): Trübner & Co. Comments: Clothboard octavo; sewn binding, 147 pp. ; Scripture text in single column, versification in the margin. Critical and explanatory annotations, together with cross references, in footnotes. The Introduction, five pp, deals with five topics: I. The Question Where Job Lived. – II.The Question When Job Lived. – III. The Question When the Book was Written. – IV. The Question Who was the Author of the Book, and in What Language it was Written. – V. The Division of the Book. 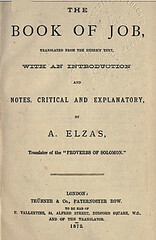 Publisher: London, England (U. K.): Trübner & Co. Contents: Minor Prophets: Hoshea [and] Joel; – Preface; Introduction – Appendix: List of Subscribers. 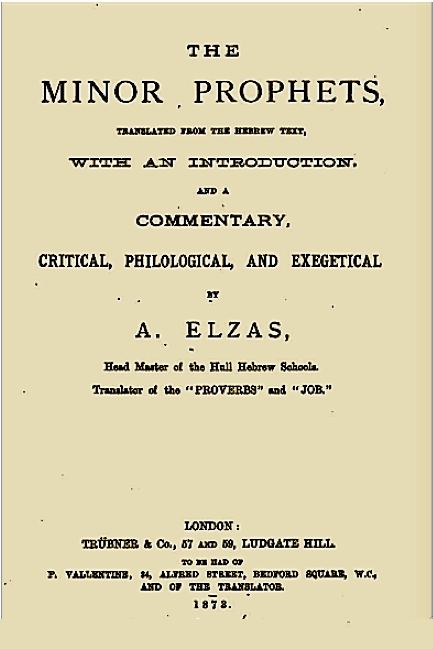 Advertisement / Praise for “The Proverbs of Solomon“ and “The Book of Job“. Comments: Clothboard octavo; sewn binding, 129 pp. ; Scripture text in single column, versification in the margin. Explanatory annotations, together with alternate readings, cross references etc., in footnotes. 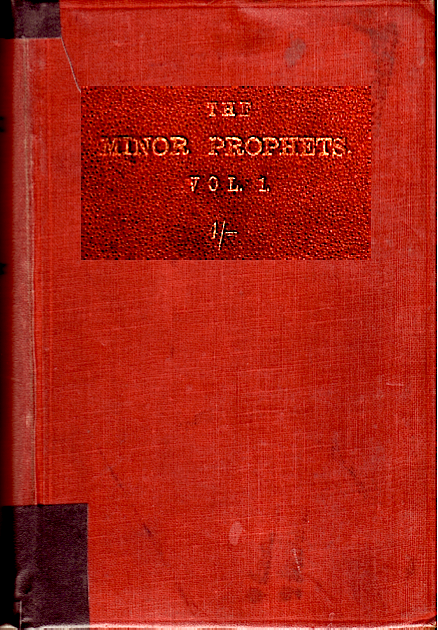 Contents: Minor Prophets: Amos, Obadiah, Jonah. – Introduction – Appendix: Opinions on “The Minor Prophets, Vol. I“. Comments: Clothboard octavo; sewn binding, 85 pp. ; Scripture text in single column, versification in the margin. 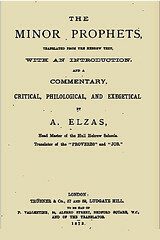 Explanatory annotations, together with alternate readings, cross references etc., in extensive footnotes. Each book is introduced separately.